How are y'all this morning? I know this post is a bit late this morning as I normally post around 7 am, but I'm loving sitting in the union typing up the day's post between classes. 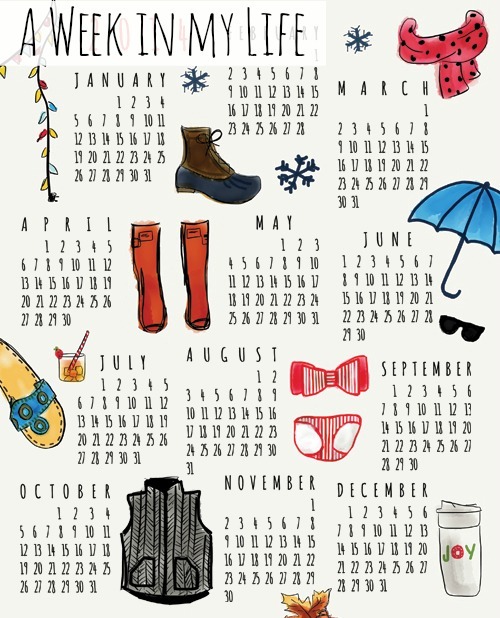 It makes me feel like a real blogger, if that makes sense, so I hope you don't mind! The beginning of last week was a bit stressful as I am starting to get anxious for my trip in a few weeks and was trying to decide whether or not to drop one of my classes, but I settled all of that in time for a spectacular weekend! Literally my favorite Snapchat of the entire day. Carol, you are so fab. 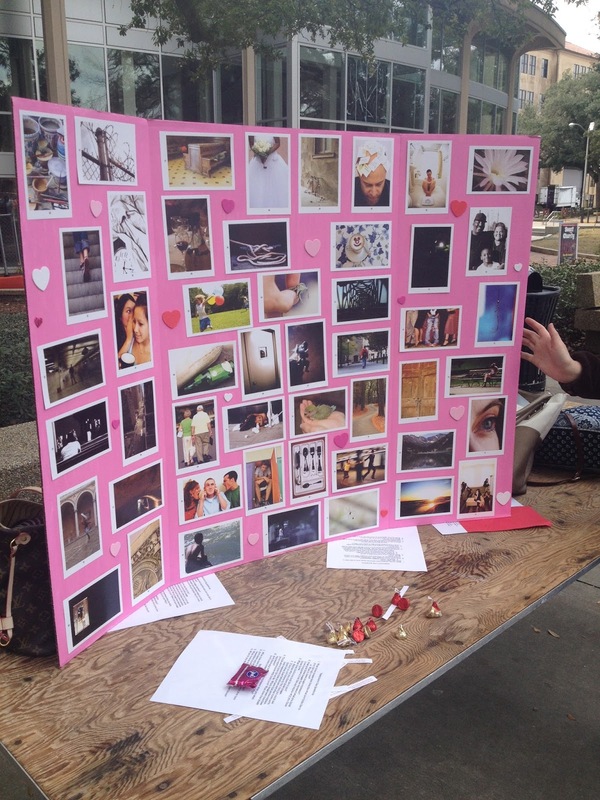 After eating breakfast in bed and having the best time reading the Blogentine's posts, I spent the afternoon in what LSU calls "Free Speech Alley" talking to students and visitors about the love in their life and what God's love looks like to them (they answer using the pictures). It was such a rewarding experience as I had so many meaningful conversations and with the lovely weather it made things 10x better. The funniest part of this whole setup was that the Planned Parenthood table was across from us giving out free condoms, which made for an interesting afternoon. 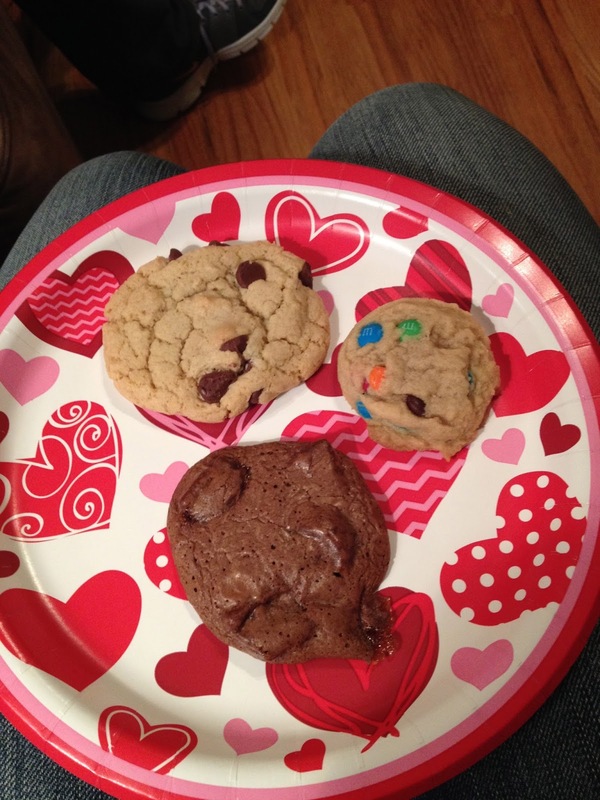 As a sisterhood thing, a bunch of us made little Valentines and hung them up at Chi O. This is mine from Allyce and needless to say, it made me laugh for a good 5 minutes! 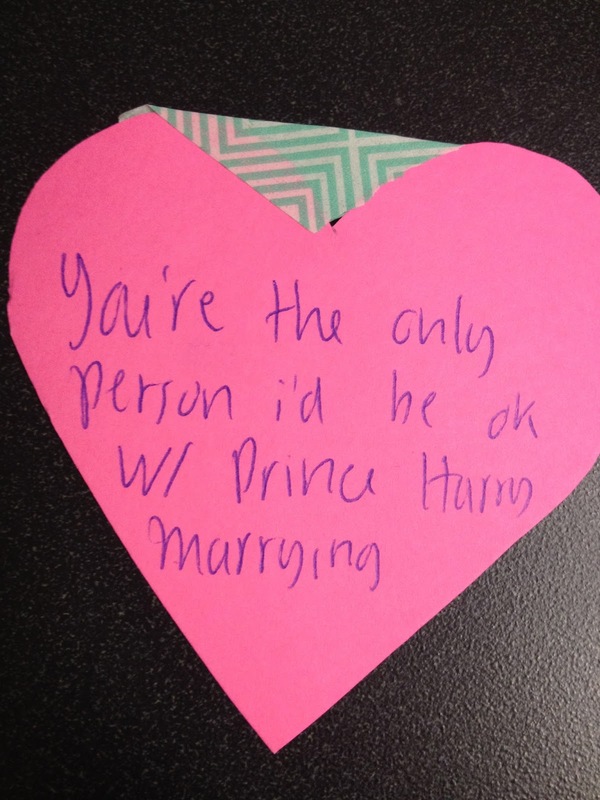 My Valentine from Katie! She knows I'm obsessed with Reese's and so this made my day! The card was super funny too as per usual! 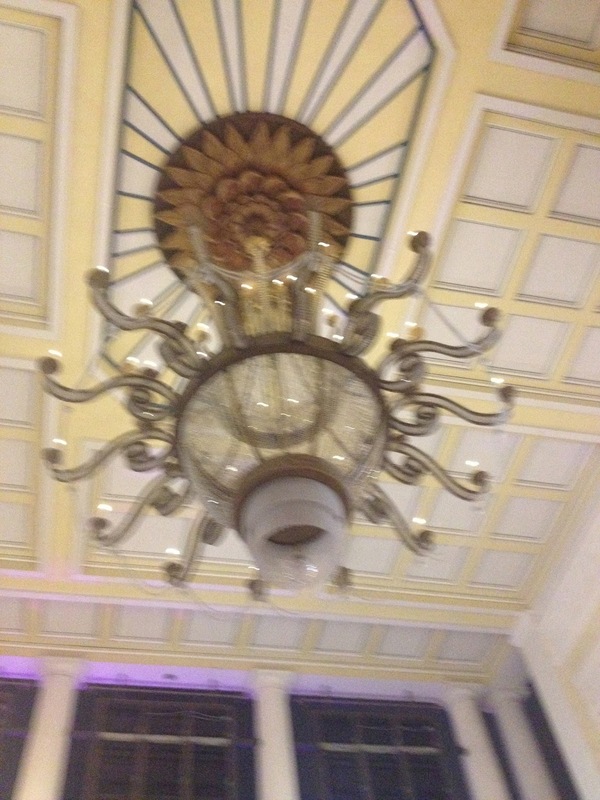 I know it's hard to tell due to terrible picture quality if this is in-fact a light fixture or an octopus, but I assure you, it's just a chandelier. On Friday night Katie and I went to see "Winter's Tale" at Perkins Rowe and this is outside of the theatre. I always love it and have yet to get a good picture of it! Winter's Tale was pretty good, but it left both Katie and I wondering how we felt about it. I really enjoyed the first part set in 1915 as the actors were amazing, but the modern day part felt a bit rushed. Good all in all, but some parts could've been improved. On Saturday morning, I went see Endless Love with my Chi O pledge class. As much as I feigned vomiting at the previews, it was actually really good! The unrealistic love parts were cheesy of course, but there were lots of funny an unexpected parts that were left out of the previews and I really enjoyed it! Later that day, I went to Katie's family's camp and stayed the night there. I really love the camp because it's right on the water, it's so relaxing, and there is never any schedule or things that have to be done. There really aren't any other parts of my life that are not scheduled so I love when I'm able to go and her family is so fun to hang out with! I love having lazy mornings, stumbling down for breakfast, and then swinging on the deck…it was wonderful. I am obsessed with the Baton Rouge bridge, especially at sunset, so I had to snap a pic! After getting home on Sunday afternoon, I took a quick shower and then met with some of my bible study girl friends. We do this thing called Chicks and Chocolate and it's just a time to hang out and talk about our lives. I love having people to grow in my faith with and they are such amazing girls! Last night I met a girl from LSU who loves 1D and is planning on going to Nottingham in the fall, just like me! It was too cool! After that, Katie and I went to my favorite pizza place, Johnny's, and ate and talked for a long time. I love when we have great conversations and we are just so on the same page feeling the same way…our friendship is such a blessing! So that's about it lovelies! I am writing this fully refreshed after a wonderful weekend and with such a happy heart! Happy Monday! How was your weekend?